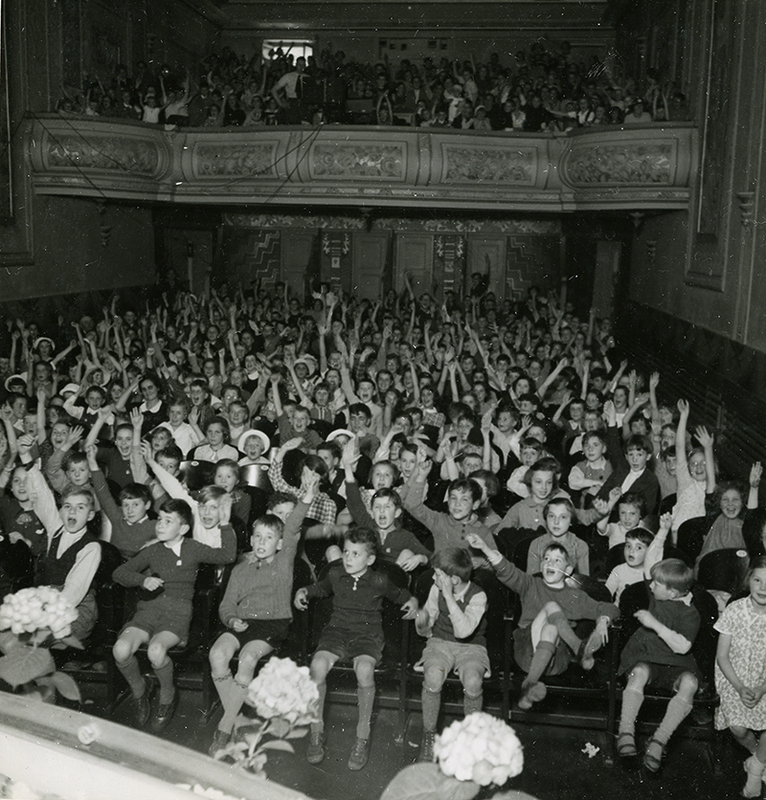 Today it is just a memory, but from the 1930s to the 1950s the Fip-Fop Club sparked a small revolution: Thanks to its mobile cinemas, children under 15 years of age were able to visit film screenings in their municipalities. An enormously successful club for children, the Fip-Fop Club, was founded by Nestlé in 1936. In the 1930s, this company was one of many attempting to focus especially on the Swiss market and to tap into new, young groups of buyers. However, marketing departments that targeted children were constantly walking on eggshells, since parents and teachers often denounced imposing consumerism and consumer needs onto children as unethical. Thus, in those days children’s entertainment always had an educational dimension. Like the Globi Club, the Fip-Fop Club was a socially and politically conscientious programme based on solid Scout standards. 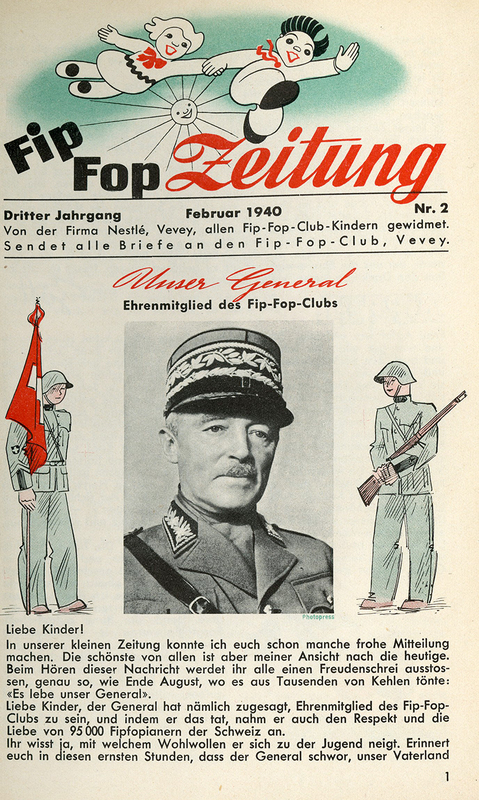 For example, the Fip-Fop Club taught children how to become good citizens in line with the spiritual defence of the nation, and even General Guisan was appointed as an honorary member in 1940. The club’s mascots, the twins Fip and Fop, were created by commercial artist Hans Tomamichel, who later became famous thanks to his Knorrli advertising figure. One of the key elements of the club were the collectors’ cards, which were already a well-established advertising practice. Nestlé and the merged chocolate companies Peter, Kohler and Cailler enclosed small, colourful pictures in their chocolates, which could be pasted into elaborately designed collectors’ albums. Renowned authors and designers were enlisted to create texts and artwork for these picture albums. The cards were feverishly haggled over and traded on playgrounds – like Panini trading cards today. 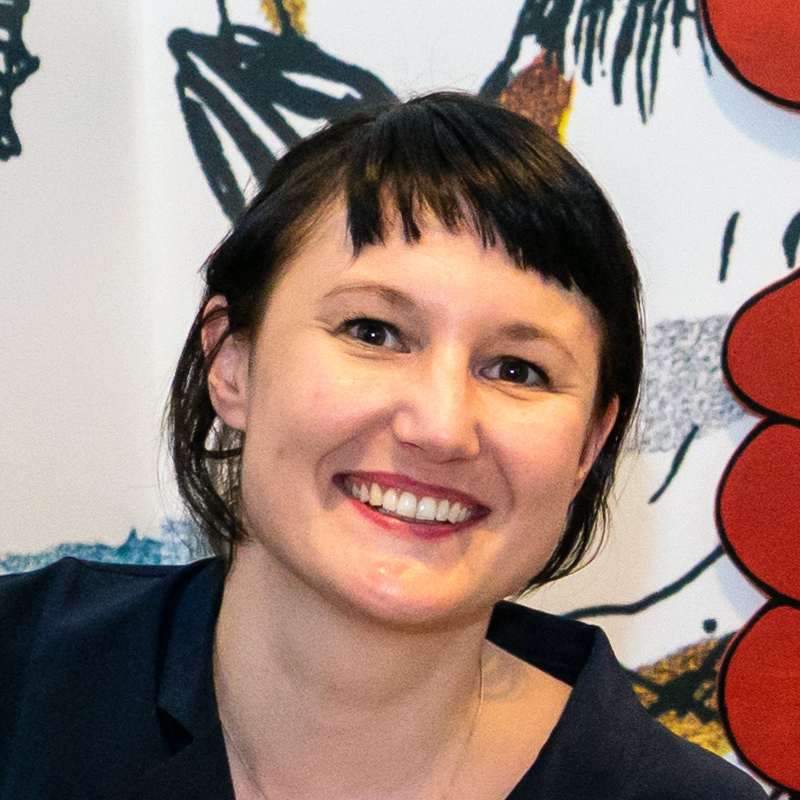 For one Swiss franc, children received membership badges which granted them access to afternoon film screenings held in various Swiss municipalities. Three teams travelled twice a year and held more than 500 afternoon film screenings in over 300 locations. They stopped over in cinemas, theatres and pub halls and showed cartoons, advertising films for Nestlé products, documentaries and nature films, comedy flicks and, from 1940, the Swiss weekly newsreel. Children between 5 and 15 were finally able to go to the cinema. This was a major happening, since in most cantons you had to be 16 or older to be allowed into the cinema. These mobile cinemas had a profound impact on the film experiences of several generations of Swiss men and women. Nestlé was not the only company that used film screenings for direct marketing, but it was the only company that exclusively targeted children’s audiences. Karl Lauterer, then head of advertising at Nestlé, was the poster child of this successful advertising model and referred to himself as “Götti” (godfather). In addition to Lauterer, other “aunts” and “uncles” hosted the children’s afternoon screenings. The children were permitted to do the unthinkable; they were allowed to take part in the performances, encouraged to sing, yell and shout “Hop Fip-Fop” over and over again. The film screenings were arguably the most attractive offering of the Fip-Fop Club, and members also received the Fip-Fop magazine. It was published in French, German and Italian, and in 1949 had a total circulation of around 120,000 copies. The Fip-Fop Club came to an end in 1959. Competitive pressure from television and easier access to regular cinema screenings had made it superfluous.